Posted on Jun.23, 2013 by Barry Bookmark the Permalink. 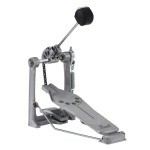 The Drum Workshop DWCP6000AX Bass Drum Pedal does not have a base plate. A favorite of lighter style players, it's a light weight pedal with single chain, Delta hinge, and Accelerator Drive (Off-Set Chain & Sprocket). It compacts easily and the radius rod holds the frame securely. This is the updated version of a classic pedal. 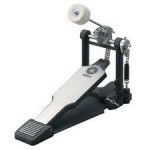 The Pearl P-930 Longboard Pedal is referred to as the "Demonator". Based on the design of the famous Demon pedal, the P-930 is a single chain, interchangeable cam, bass drum pedal. Extremely fast with a sleek footboard, this is a heavy-duty and road-worthy piece of hardware. 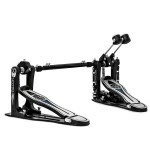 The double pedal equivalent is the Pearl P-932 Longboard Double Pedal. 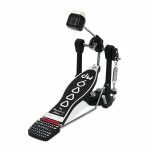 A lightweight pedal, the Yamaha Bass Drum Pedal Belt Drive FP-8500B has a nylon belt, not a chain, for quiet controlled playing. The design has a metal frame to secure the pedal without a base plate. It is an easy pedal to pack and for players who are looking for a pedal without a chain link --- this is a good one! 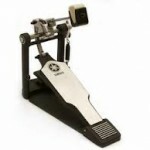 The Drum Workshop DWCP9000 Bass Drum Pedal is an amazingly smooth pedal. It has a double chain (Nylon strap included) with infinite cam adjustment, free-floating rotor, and solid base plate. Spurs on the side anchor the pedal. One of the quietest pedals available. A carrying bag is included. 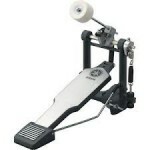 The Drum Workshop DWCP6000NX Bass Drum Pedal features a nylon strap and no base plate. The nylon strap is extremely quiet. The radius rod replacing the base plate allows the pedal to collapse easily for transporting. The Cam is Off-Set. This is the updated version of a bass pedal classic. 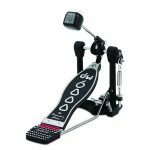 The Drum Workshop DWCP9002 Double Bass Pedal is the double pedal version of the DWCP9000. 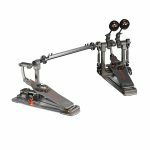 The DWCP9002 Double Bass Drum Pedal has a free-floating rotor, infinite cam adjustment, and chain drive or nylon strap option. One of the smoothest double pedals on the market. It "plays itself." This is a top of the line pedal with many features. Case included. Left footed version available. 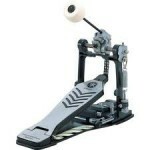 Since first introduced, Danmar Bass Drum Pedal Beaters have been favorites of top drummers world wide. 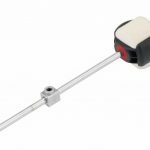 The beater heads are permanently attached to the bend resistant rod using a patented system. A few of our favorites are: Red Hard Wood Black Shaft (solid hard hitting); White Felt Black Shaft (General purpose hard felt beater); J.Robinson Red Hard Wood (Direct, Square shaped); and the Fluffy Black (Medium Soft for round sound). The Pearl P-3000C Demon Chain Drive Pedal the original "Demon Drive" with a chain. Completely adjustable features as on the regular "Demon Drive", in addition, it has an adjustable cam for the chain. Case included. Free shipping continental US. 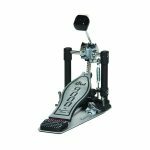 The Pearl P-932 Double Longboard Pedal is a double pedal featuring the Pearl P-930 Longboard Chain-Drive Pedal. Based on the design of the famous Demon pedal, the P-930 is a single chain, interchangeable cam, bass drum pedal. Extremely fast with a sleek footboard, this is a heavy-duty and road-worthy piece of hardware. This is a lightweight Single Chain Pedal designed for lighter playing. Easy to transport and assemble, the FP-7210A is quiet and smooth. The action has no delay and packs compactly. The FP-8500C has a double chain link and a base plate for stability. The footboard tends to be longer than the normal design and is great for heel-toe technique. A nylon belt is included for players wishing to switch to belt drive. It comes with the popular hard felt beater. This is a double chain, heavy duty pedal. The pedal comes with an additional strap for belt drive. The FP-9500C is a great touring pedal when you need a dependable, reliable pedal on the road. It is ideal for heavy-footed players with a strong base plate A carrying case is included. The FP-9500D is designed for heavy footed players. It has a Direct Drive Cast link. It is not a chain linked pedal. The direct drive "pushes" the footboard back on rebound, giving the pedal a quicker response. Many drummers that play heel-down prefer the feel of this pedal. It comes with a double surface beater and carrying case. 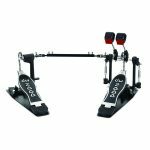 The DFP-8500C has extra long footboards designed for heel-toe playing. It is double chained and comes with hard felt beaters. An optional woven nylon belt is included for those preferring belt drive. 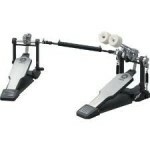 This is a very smooth double pedal with side adjustable hoop clamp for secure fit. Instead of a chain link this pedal uses a Cast design.It is a direct drive double pedal, with a solid cast link between the rocker shaft and the footboards. The direct drive "pushes" the footboards back on rebound, giving the pedal a quicker response. 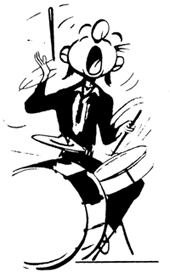 Many drummers that play heel-down prefer the feel of a direct drive. The DFP-9500D has adjustments for beater angle, footboard angle, and spring tension. It comes with a double sided beater and carrying case. 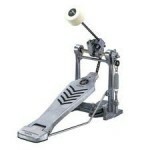 The Drum Workshop DWCP5000AD4 Bass Drum Pedal has been a very popular all-around pedal. It has Accelerator-drive (off-set Chain and Sprocket), Delta hinge, double chain with base plate. 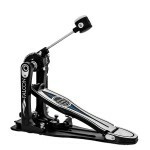 It is a smooth action pedal and great for heavy foot work. This pedal design has been a constant top pick for players many years! Carrying bag is included. 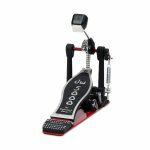 The Drum Workshop DWCP5000TD4 Bass Drum Pedal is a Turbo-drive pedal. This bass pedal has a Center Chain & Sprocket cam. It has a double chain with the Delta hinge. Good for heavy foot playing and all styles of music. Carrying bag is included. 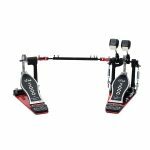 DW has engineered the Drum Workshop DWCP2002 Double Bass Pedal with the same technology as their other pedals. 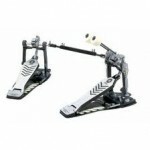 However, it has a Single Chain and is a more basic version of the top of the line pedals. It is very price competitive and does have base plates included. Great for entry level players and novices. 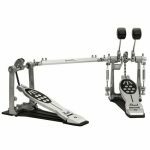 The Drum Workshop DWCP5002AD4 Double Bass Pedal is Accelerator-drive (Off-set Chain & Sprocket), Delta hinge, with a double case. 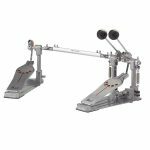 It has a double chain and is the most popular of the Drum Workshop double bass drum pedals. Roadworthy with great action and very durable. A case is included. Lefty version available. 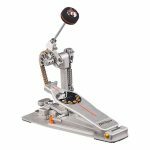 The new P-830 pedal is designed after the footboard on the Demon pedal. It has a longer footboard and is great for players who play toe-up. This is a replacement for the older 700 series and is Pearl's lightest weight bass pedal. It is single chain, very fast, economical and easy to transport! 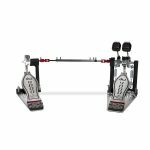 The innovative Falcon Single Bass Drum Pedal is extremely fast and responsive. It is an easy pedal to adjust and maintain and will give many years of service. The self-adjusting hoop clamp fits all bass drum diameters and will fit at different angles. It has a reduced base plate size which allows for better positioning of your other hardware. 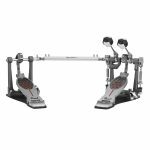 The smaller size of the base plate on the Mapex Falcon Double Pedal assures you of easy adjustment around your hi-hat and snare drum. This is a very fast, smooth pedal and is built to last. The self-adjusting hoop clamp makes for an easy setup and will fit all base drum diameters. The pedal is available in a Lefty setup. With a reduced profile, Pearl’s improved Quad Beater B-250QB provides the same four beater surfaces of the original (two hard plastic, two felt) but with the added feel and power of the Control Core center to eliminate vibration. If your music is constantly evolving this is a must beater to have. The P922 Powershifter has solid features including a single chain drive with Linear Action Cam, offering a new level of speed for chain-driven pedals. Additionally,it comes standard with Duo-Beater, infinite beater angle and powerplate base. Classic Pearl technology and durability. 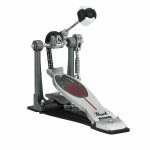 The Pearl P2050C Eliminator Chain Bass Drum Pedal incorporates new NiNja Bearings developed by skateboarding engineers. 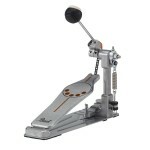 The advanced technology makes this Eliminator pedal very fast and quiet. It has a dual chain drive with interchangeable cams. It has a click-lock spring adjustment for desired spring tension. The footboard is moveable forward or back for drive angle settings. Quiet, fast and versatile. Case included. 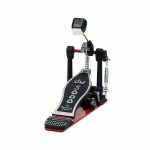 The Pearl P2050B Eliminator Belt Bass Drum Pedal is Belt Driven. It incorporates new NiNja Bearings developed by skateboarding engineers. 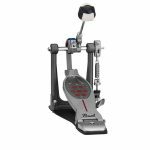 The advanced technology makes this Eliminator pedal very fast and quiet. It has a dual belt drive with interchangeable cams. It has a click-lock spring adjustment for desired spring tension. The footboard is moveable forward or back for drive angle settings. Quiet, fast and versatile. Case included. 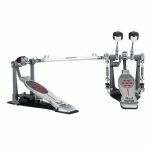 The Pearl P2052B Eliminator Redline Belt Double Pedal Right Footed Double Pedal incorporates new NiNja Bearings developed by skateboarding engineers. 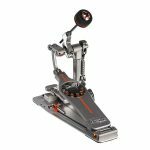 The advanced technology makes this Eliminator pedal very fast and quiet. It has 2 dual belt drives with interchangeable cams. It has a click-lock spring adjustment for desired spring tension. The footboard is moveable forward or back for drive angle settings. Quiet, fast and versatile. Case included. FREE SHIPPING WITHIN CONTINENTAL USA!